All of a sudden, Ann and I are adults (well, more adult-like, at any rate). Jack is the primary motivator of this recent development, what with his babyishness and our sudden parenthood. But don't let the Wii fool you – we've brought this new adult-ish revolution to the home as well as the family. 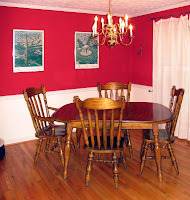 Behold: we now have a real dining room (as opposed to our previous, ad hoc dining room, at right). Where once was found a second-hand dining room table (JD's childhood kitchen table, to be precise) and some framed posters of Paris from Ann's adolescent trip to France, we've upgraded to our very own dining room set, courtesy of Bassett. We've actually been wanting to do this for a while. Sadly, the dining room project trumped the gigantic TV project simply because we needed to get the china and crystal out of the nursery so Jack could use his closet. 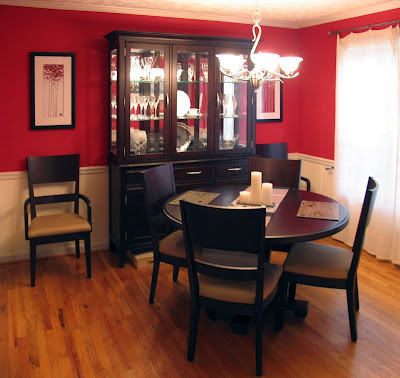 But it turns out that the wedding china and crystal looks really good on display. 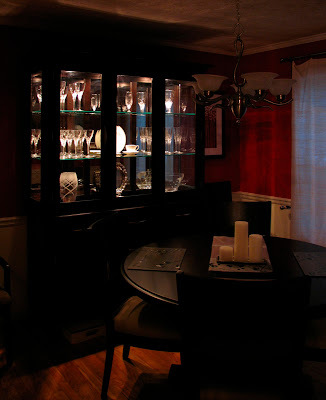 So until we finally have a fancy dinner, here's a looksee at the china cabinet all lit up. And until we get that giant TV, the shiny cabinet will have to do. Fret not ... pictures of Jack will return next week.